OMAHA, NE--(Marketwired - July 20, 2015) - Linoma Software unveils GoAnywhere MFT (Managed File Transfer), version 5.0 of its GoAnywhere secure file transfer software. The upgrade combines the workflow automation capabilities of Linoma's popular GoAnywhere Director solution with secure file transfer protocol (FTP) features from GoAnywhere Services into a single product. In addition, the merged product adds numerous significant enhancements. 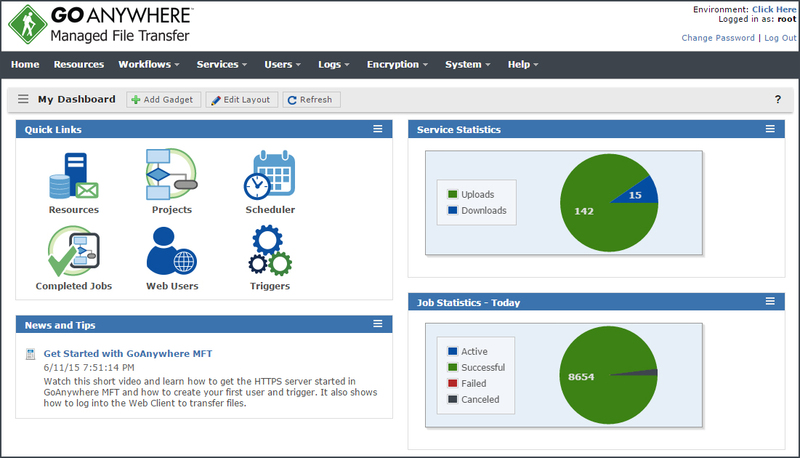 GoAnywhere MFT 5.0 introduces a brand new and customizable browser-based dashboard with more than 20 gadgets providing statistics, graphs, and details of file transfer activity and critical system information. Each administrator has their own personal dashboard, and can arrange informative gadgets to quickly monitor the activity most important to them. The upgrade delivers advanced Reporting features that include various PDF reports that cover system information and file-transfer activity with details and graphs. A Security Settings Audit report will analyze a GoAnywhere MFT server's security settings to determine compliance with the Payment Card Industry Data Security Standards (PCI-DSS) requirements. The report also suggests actions needed to remedy the settings that are non-compliant. GoAnywhere continues to provide individual audit logs for job activity, triggers, and file transfers (SFTP and FTP/s, HTTP/s, AS2). The product's new version improves logging by sending the individual log events to a global index for faster, system-wide search results. The new Global Search can be used to quickly find events for a particular file name, a specific user name or a wide variety of 'Google' like search criteria. Licensing for GoAnywhere MFT has been revamped allowing Linoma to offer a completely free FTP server, including functions to automate FTP transfers. Every edition of GoAnywhere MFT also includes 10 free user accounts for GoDrive, the on-premise enterprise file synchronization and sharing solution. Founded in 1994, Linoma Software provides innovative solutions for managed file transfer and data encryption. With a diverse install base of more than 3,000 customers around the world, Linoma's focus on research and development, as well as customer service and support, contributes to its leadership in the software industry. GoAnywhere™ is a managed file transfer and secure FTP solution that will streamline and automate file transfers with trading partners, customers, employees and internal servers. Enterprise level controls and detailed audit logs are provided for meeting strict security policies and compliance requirements including PCI DSS, HIPAA, HITECH, SOX, GLBA and state privacy laws. GoAnywhere can be installed on most platforms including Windows®, Linux®, IBM® i (iSeries®), UNIX®, AIX® , and Solaris®, and supports popular protocols including FTP, SFTP, HTTPS, Open PGP, AES and AS2. Optional modules include Secure Mail for ad-hoc file transfers and NIST® certified FIPS 140-2 validated encryption. The GoAnywhere Managed File Transfer browser-based Dashboard can be customized by each administrator to quickly monitor the activity most important to them.